For Jews in Iraq, a wolf's tooth was a popular good luck charm. It inspired Carol Isaacs, an artist and musician, to produce an original graphic memoir, accompanied by live Middle Eastern music. 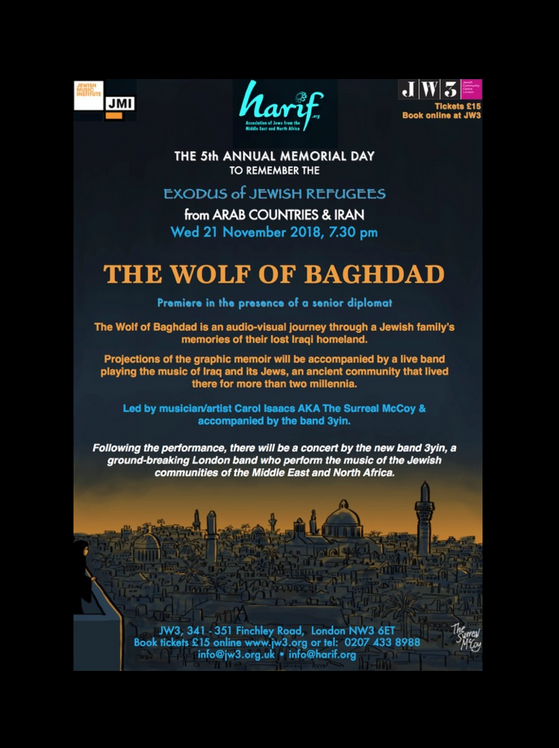 The Wolf of Baghdad will have its premiere on 21 November in London for the 5th Memorial Day to remember Jewish Refugees from Arab Countries and Iran. (Booking link here) In her animated presentation, Carol imagines herself travelling back with the wolf to her family's roots in Iraq, and explores the complex relationship of second-generation Jews in the West with their Mizrahi origins. Rebecca Taylor interviewed Carol for Jewish Renaissance. 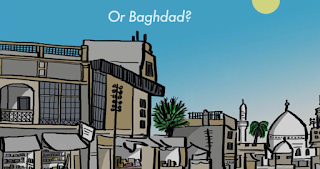 Where do I belong, London or Baghdad? Video clip here. RT: Did you grow up being aware of your Iraqi background? CI: No, my parents didn’t talk about it. I started playing music when I was four years old, but if I think about music in my parents’ house, it was classical. In Baghdad they were very Europeanised. Theywore European clothes and had European names. I never heard any Arabic music in the house. in a pinstriped suit, with arose from the garden in his buttonhole. The only vestiges of Iraq were in the food. My mother was a fantastic cook– she made great bourekas. what was going on back home. On those occasions I felt as if I lived in two worlds. RT: Do your Iraqi roots influence your own music? 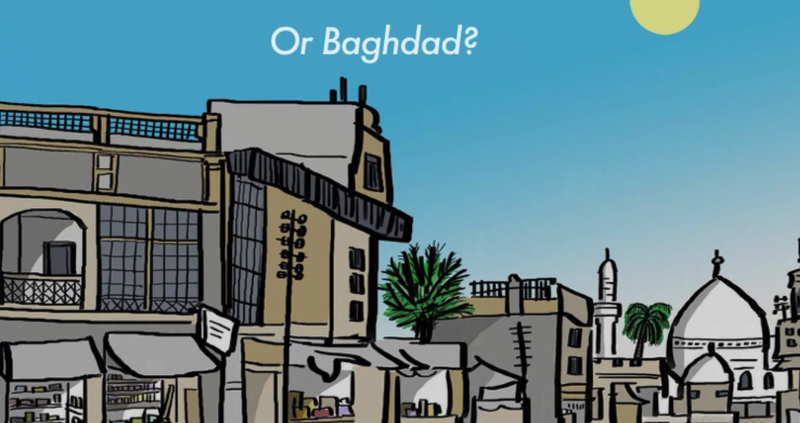 RT: Would you like to go to Baghdad? CI: I have mixed feelings about the place. All my life I’ve known that the Iraq that my family has spoken about with such affection is not there any more. Our houses are gone, the cemeteries are gone. There is one hidden synagogue that is looked after by some Muslim residents. There is nothing left of that former life. That’s what the memoir is addressing: on the one hand, why would I want to go back? On the other hand, I have that longing for a place I don’t know. It’s something that many second generation immigrants have. Hatikva (was heard a second time) in Abu Dhabi as Israeli judoka Peter Paltchik won gold in the under 100 kg weight category on Monday. Paltchik defeated Azerbaijani judoka Elmar Gasimov in the finals. Paltchik, who was born in Ukraine and moved to Israel when he was 9 months old, began learning judo at age four. The 26-year-old judoka won his first gold medal at the "Grand Prix Cancun" in June 2017. He also won a bronze medal in the 2018 European Judo Championships that was held in Tel Aviv in April. Judoka Sagi Muki won gold on Sunday in the under 81 kg weight category. Israel's national anthem "Hatikva" was played, even though sport event organizers in the Guft have made Israel's participation conditional on it not displaying national symbols. Culture and Sports Minister Miri Regev, who was in attendance, openly wept. 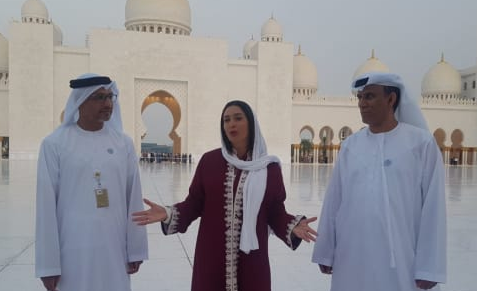 Following the event on Sunday, Regev made an official visit to the Sheikh Zayed Grand Mosque in Abu Dhabi. “The whole message here is of unity and peace,” she stated. 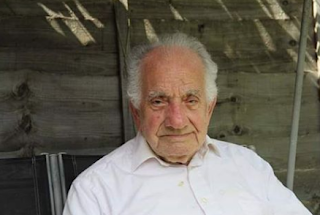 Update: friends and admirers will gather at 10 am on Sunday 4 November at Golders Green Crematorium, Hoop Lane, London NW11 to pay their respects to Heskel Kojaman. The death is announced of the great Iraq-born musicologist and author, Heskel Kojaman. A member of the anti-Zionist League and then the Communist party of Iraq, Kojaman was arrested in 1949, released in 1958 but re-arrested; he spent another 18 months in prison. He spent his latter years in London and is survived by his wife Habiba. "Heskel Kojaman has passed away two months before his 98th Birthday. He was a man of great intellect and wrote regularly in “Alhewar”. In fact, he was such a prolific writer that, last year I checked, he had written some 560 articles. He studied avidly communist ideology and was strongly principled in his interpretations and approach. He spent many years in prison in the infamous Niqrat Salman and other Iraqi prisons. He was a strong lover of music and studied Iraqi Maqam and wrote a book that is considered the most important source of Iraqi traditional music. He was thought of as an expert musicologist and was visited by many Iraqi musicians and singers as he kept an open house for all the writers and musicians." 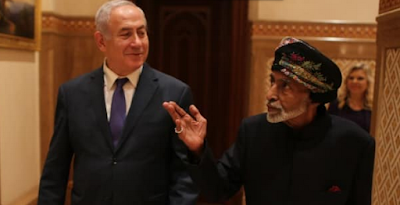 The visit of Israel's prime minister Benjamin Netanyahu to the Sultanate of Oman may have taken much of the western media by surprise. In fact relations between the two countries have been an open secret for some time. Netanyahu's is the latest in a series of visits by Israeli leaders: Yitzhak Rabin in 1994, Shimon Peres in 1996; the Omani foreign minister paid a visit to Jerusalem in 1995. Israel even had a trading mission until it was shut down at the outbreak of the second intifada in 2000. In 2008, Tsipi Livni, then Israel's foreign minister, visited Oman. The small gulf state of Muscat and Oman, on the trade route to India and the far east, has been home to a small community of Jews until recently. The grave of the prophet Job is said to be 45 miles from Salalah, located in the south, and very close to the border with Yemen. Benjamin of Tudela, who kept a diary on Jewish communities around the world, visited Muscat around 1170. Jewish merchants lived in Suhar since medieval times. According to the Gazetteer of Place Names in Muscat, published in the 1970s, travellers reported the presence of Jews in Muscat in 1625 when the port was under Portuguese control. A synagogue was built in 1673. In 1828 Jews fled the oppressive rule of Daoud Pasha in Baghdad and settled in Oman, where they practised silvercraft, money-lending and alcohol production. It was claimed that Oman had as many as 350 Jewish families there, mostly from Yemen and Iraq. Between 1830 and 1860 they represented British interests, as in the port of Aden, but by 1900 they had mostly disappeared. The last Jew of Oman was thought to be Sulayman al-Yehudi. He left the state in 1948: his children and grandchildren converted to Islam. Today expatriate western Jews live in the sultanate, but there is no official Jewish community. Who owns Middle Eastern Jewish culture? The fate of ancient Jewish archives rescued from war-torn Iraq is at a crossroads. Lyn Julius reports in Jewish Renaissance (October 2018) on the fierce debate over the ownership of Jewish history. 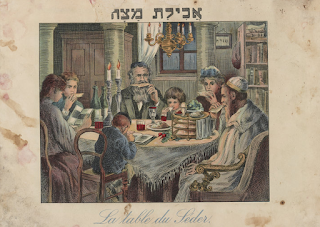 Writing in the Arabic newspaper Elaph in December 2003, journalist David Kheder Bassoon expressed the anger and frustration felt by Iraqi Jews living outside of their country at the uncertain future of the Jewish archive – the enormous collection of books and manuscripts that document Jewish life in Iraq. This autumn marks the deadline for the return of these materials to Baghdad from where they were rescued by American troops in 2003 and taken to the US. Under Saddam Hussein, thousands of books, manuscripts and other documents were seized from Jewish homes, schools and synagogues. Much of it was locked away at the headquarters of Iraq’s secret service in Baghdad. In 2003, the archive was discovered in the flooded basement of the building, containing tens of thousands of items including books, religious texts, photographs and personal documents that activists say were looted or left behind by Jews forced to flee the country. The Americans shipped the archive to Washington DC for restoration and hastily signed a diplomatic agreement promising to return the material to the Iraqi government. The US government spent over $3 million to restore and digitise the archive, which has been exhibited across the country. The collection includes a Hebrew Bible with commentaries from 1568, a Babylonian Talmud from 1793 and an 1815 version of the Jewish mystical text Zohar – as well as more mundane objects such as a Baghdad telephone book. Although tens of thousands of Iraqi documents were shipped to the US, the Iraqi government has only formalised its claim to 2,700 books and 30,000 documents of the water-stained archive, which it claims are the country’s ‘precious cultural heritage’, a last emotional link with its ancient Jewish community, and a reminder of Iraq’s former diversity. But over the past five years, the Iraqi Jewish community in exile has been waging a bitter battle to recover the collection and prevent it being sent back to Iraq. They say that to return the archives would be like returning property looted by the Nazis to Germany. Activists argue that the archives should be kept somewhere where they are accessible to Iraqi Jews and their descendants, and question whether Iraq would properly take care of the items were they to be sent back. A similar fight is simmering for many Jews of Egyptian origin living abroad. Dozens of volumes, containing every detail of the births, marriages and deaths of Jews from Alexandria and Cairo, and dating back to the middle of the 19th century were once kept in the two main synagogues in each city. But in 2016, government officials arrived unannounced at the synagogues and took away the registers to be stored in the Egyptian National Archives. Access to the records is restricted. The Egyptian government claims that all Torah scrolls and Jewish archives, libraries, communal registers and any movable property over 100 years old constitutes part of Egypt’s national heritage. Egyptian Jews living abroad are frustrated that they cannot even obtain photocopies of brit mila (circumcision),marriage and death certificates from these communal records. Such records are often the only formal Jewish identification Egyptian Jews have to prove lineage or identity for burial or marriage. Repeated efforts since 2005 to intercede with the Egyptian authorities have come to nothing. In this case, the Egyptian government has been supported by the tiny remnant of the Jewish community that remains in the country. The community’s leader, Magda Haroun has made it clear in various TV appearances that her intention is to leave the community’s assets to the government. Last year Haroun helped revive a former Egyptian Jewish charity, A Drop of Milk, turning it into a heritage NGO with the aim of curating the Jewish archive with the approval of the Ministry of Culture. There are plans to transform the former Heliopolis Synagogue in Cairo into a national Jewish museum, with the hope that the archive’s registers will be available for consultation there. Most Egyptian Jews left the country after 1948 and again after 1967. The biggest ex-pat Egyptian community is in Israel, but there are groups in France, Canada, the US, Brazil, Australia and the UK. But for organisations fighting on behalf of the rights of Jews from Arab countries, the Iraqi and Egyptian cases are symptomatic of a larger problem. Since 2004, the US has been bound by law to impose import restrictions on archaeological and ethnological material that constitutes a country’s cultural heritage and has signed Memoranda of Understanding (MOUs) to this effect with Egypt, Syria and Libya. An agreement with Algeria is expected. In January 2018, the International Council of Museums released a ‘Red List’ for Yemen aimed at protecting Hebrew manuscripts and Torah finials from leaving Yemen. All but 50 Jews have fled the country, taking what possessions they could, but even these ultimately could be returned to Yemen. “These MOUs claim to be about [stopping] looting, but their broad scope and limited evidence of success suggests their real impact is providing a legal vehicle to legitimise foreign confiscations and wrongful ownership claims…The MOUs are based on a flawed premise. It is the heritage and patrimony of 850,000 indigenous Jews who fled their homes and property under duress,” says Sarah Levin of the California-based Jews Indigenous to the Middle East and North Africa (JIMENA). It is understandable that the international community should wish to prevent the looting and smuggling of ancient artefacts and their sale on the international art market. That is how Islamic State financed much of its conquest of northern Iraq and Syria. Jewish artefacts purported to be from devastated sites, such as the Jobar synagogue near Damascus, have turned up in Turkey. These mostly turn out to be fakes. 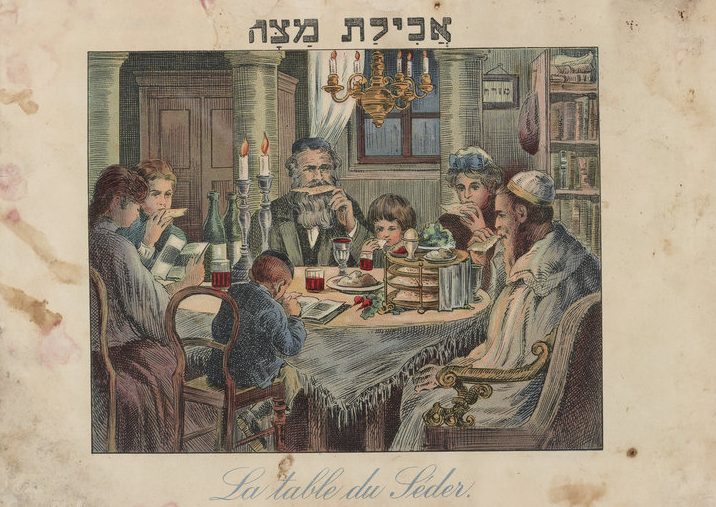 In Syria, mindful of the interest in Middle Eastern Jewish heritage in the West, both the regime and the rebels have been using Jewish artefacts as a political football in the civil war. Reports have surfaced - usually at times of regime offensives - in which both parties accused each other of stealing cultural heritage from Jewish sites. But there is a distinction between theft for financial gain, and legitimate salvage of Torah scrolls or books taken by fleeing Jews to be used for prayer. In centuries past, armies had carte blanche to plunder enemy property. The ‘Monument Men’ were assigned by the Allies to hide away cultural treasures in occupied Europe during World War II to prevent them from falling into the wrong hands. Postwar international treaties, such as the Hague Convention of 1954, were introduced to protect states’ cultural property from wartime looting. But the days when Britain could ship the Elgin Marbles from Greece, or Napoleon could plunder ancient Egyptian obelisks as ‘war booty’, are over. In the aftermath of extensive looting after the invasion of Iraq, some 3,800 archeological artefacts have been returned to Iraq from the US. Recently eight Sumerian artefacts sold to the British Museum were sent back. But the Iraqi-Jewish archive does not belong to some long-extinct civilisation: some of the owners are still alive. International law is based on the outmoded assumption of territorial sovereignty. It needs updating, specifically to resolve the tug-of-war between minority and national heritage, where the minority has been persecuted and displaced. Almost no Jews remain in Iraq. If the archive were to return, most Iraqi Jews – now in Israel – would not be able to visit it. Nor could the authorities guarantee its safety. Four US senators have tabled a bill and three congressmen have written to President Trump “strongly objecting” to the return of the materials. As I write, a scholar in the US, who follows these issues but has asked not to be named, has told JP that the State Department has agreed to renew permission for the exhibition of Iraqi-Jewish documents to continue for another two years. "There are some (mostly Jewish groups) who want to keep the archives in the US. They have no plan on how to do that. US museums might be reluctant to accept them, because they would be permanent custodians. Who owns the archive? Technically, the Iraqi government since it is state cultural property. The State Department has to figure out how to handle keeping the archives in the US without contravening basic precepts of international law,' the source said. The Jewish community may need to resort to the courts to assert its claims. There has been one precedent for this: lawyer Nathan Lewin successfully sued for the restitution of the library belonging to the Fifth Lubavitcher Rebbe. Seized by the Russians in 1917, it is now in New York. However, the Jews fighting to stop the return of their property to Iraq, or the release of blockaded property in Arab states, can take comfort from Article 17 of the Universal Declaration of Human Rights. This states that no individual or community should be arbitrarily deprived of their property. Lyn Julius is the author of Uprooted: How 3,000 years of Jewish Civilisation in the Arab world vanished overnight, Vallentine Mitchell, 2017.